In 2010 I found Sara Frank’s blog, and I began reading it daily. Sara shared openly about her life with a severe chronic illness and extreme pain, and she shared about how she chose joy in the midst of it all. Getting to know Sara through her blog made things less scary for me as my health declined, and I became increasingly homebound. Without even knowing it, Sara mentored me through her blog. She showed me how to live a homebound life with joy. Choose Joy was co-written by Sara Frankl and Mary Carver, and it was released in January of this year. Choose Joy contains blog posts from Sara that are woven together with Mary's words. Mary introduces each section of Sara's, giving the reader background information, sharing stories from friends, or sharing stories of her own. Choose Joy will be coming out in paperback in January 2017! You may read my full review here. This is a helpful book for any parent seeking to raise their children to be grateful, Christ-followers in a world that wants to teach us that it is all about having more. Whether you are dealing with heart attitudes of wanting more, or are needing to make big changes in your family to move away from living an entitled life, this book will be encouraging and helpful. You may read my full review here. Through her blog, and through her books, Kara Tippetts has shown the world how to live well and die well. And It Was Beautiful is Kara’s final book, and it is primarily a collection of many of her blog posts. Those who have enjoyed reading Kara’s blog will love owning a copy of her blog in book form! In this little book, Kara shares beauty and joy in the midst of the very hard grief of dying as a young wife and mother. Kara shares about the grace and peace that can be found in times of suffering. You will be encouraged to live life with joy and love, and you will learn to see beauty in the hard things in life. You may read my full review here. This book was originally published in 1980. Joni wrote it with her friend and mentor, Steve Estes, and it was a follow-up book to her autobiography, Joni. In A Step Further Joni and Steve dig deeper into Scripture to share what it teaches regarding suffering, health, and healing. This book is good, insightful, and biblical. It is especially helpful to those who are facing life-long disabilities and are wondering why God has not healed them. A Spectacle of Glory is Joni’s new 365 day devotion book. It released in October, and I have been reading an advance copy this fall from Net Galley. I have not finished the book yet, but I have read a few months of the devotions, and they are encouraging, challenging, and helpful. They devotions are short, and will be good for those who cannot read long chapters. Joni has been a quadriplegic almost 50 years. She writes from a perspective of someone who has suffered a lot from disability, but also from the perspective of a woman who has walked with God for many years. Joni’s devotions are always based in Scripture. She writes on a variety of topics including joy, perseverance, suffering, prayer, difficulty, disappointment, pain, gratitude, fear, hope, turning from sin, faithfulness, and Heaven. If you are looking for a new year-long devotion book for 2017, A Spectacle of Glory is a great book to choose! I especially recommend this book if you have a chronic illness or disability. Adelaide and I enjoyed reading this book together this year. For Such a Time as This is a great devotion book for a mother and daughter to share. Angie tells the stories of 40 different women from the Bible including Eve, Sarah, Rahab, Ruth, Esther, Gomer, Elizabeth, Mary, and Priscilla. Every page is beautifully illustrated by Breezy Brookshire. The Bible stories are well told, and there is an application section that is challenging for both moms and daughters alike. Each chapter ends with a prayer to pray for your daughter. If you are looking for a high-quality devotion book for a 6-10 year old girl, this is a good one! This year I enjoyed reading several fiction novels. Fiction is sometimes easier for me to read on my tired and brain fogged days. I read classic novels as well as several newer ones. I especially enjoyed reading two books from the Cousins of the Dove series. It is a new mystery and historical fiction series written by Mindy Starns Clark and Leslie Gould. My Brother’s Crown is the first book in the Cousins of the Dove series. There are two stories that unfold in this book. One story follows a Huguenot family facing persecution in seventeenth century France, and the other story follows modern day descendants of that Huguenot family. I enjoyed learning about the Huguenots while reading this book, and the modern-day mystery gave it just the right amount of suspense! 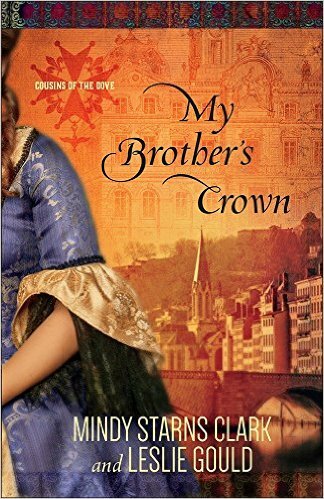 My Brother’s Crown is a great start to a fun and interesting historical fiction series. Only the first two books in this series have been released so far. Book number three will be coming out in July of next year. And now for a giveaway! I have an extra copy of My Brother’s Crown, and I would like to give it to one of you! If you would like to win this book, please enter the giveaway using the Rafflecopter form below. The winner will be notified by email on Tuesday, December 27. What books did you read this year? What was your favorite book? What do you recommend I add to my reading list for 2017?